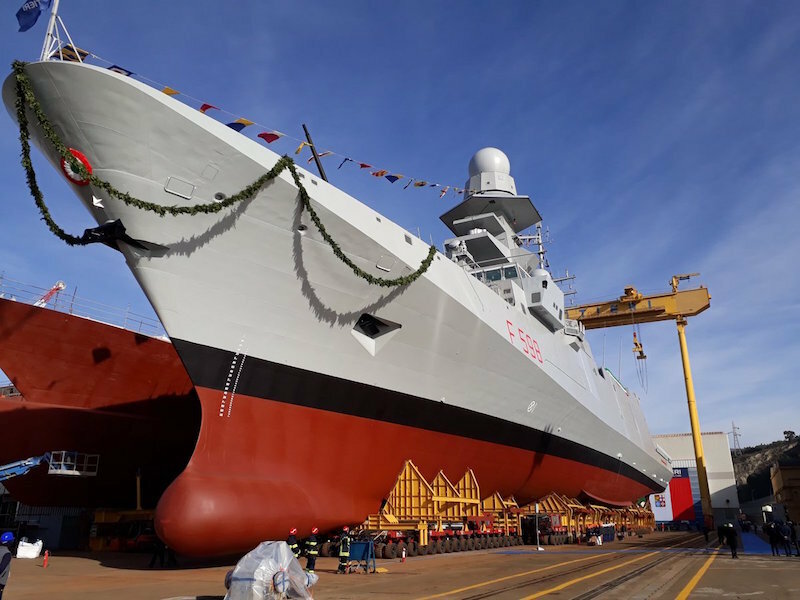 The launching ceremony of the «Spartaco Schergat» (F-598) frigate, the ninth of a series of 10 FREMM vessels – Multi Mission European Frigates, took place at the integrated shipyard of Riva Trigoso (Genoa). The 10 FREMM vessels have been commissioned to Fincantieri by the Italian Navy within the framework of an Italo-French cooperation program under the coordination of OCCAR (Organisation Conjointe de Cooperation sur l’Armement, the international organization for cooperation on arms). Godmother of the ceremony was Mrs. Anna Rosa Aonzo Grillo, daughter of the Golden Medal for Military Value, Giuseppe Aonzo. The President of Fincantieri, Giampiero Massolo, and the CEO, Giuseppe Bono, played host to Giovanni Toti, Governor of the Liguria Region, and to the Chief of Staff of the Italian Navy, Admiral Valter Girardelli, in addition to a number of civil and religious authorities. After the launching, fitting activities will continue in the Integrated naval shipyard of Muggiano (La Spezia), with delivery scheduled in 2020. The «Spartaco Schergat» (F-598) vessel, like the other units, will feature a high degree of flexibility, capable of operating in all tactical situations. 472.4 feet/144 metres long with a beam of 64.6 feet/19.7 metres, the ship will have a displacement at full load of approximately 6,700 tonnes. The vessel will have a maximum speed of over 27 knots/31 mph/50 km/h and will provide accommodation for a 200-person crew. The FREMM program, representing the European and Italian defence state of the art, stems from the renewal need of the Italian Navy line «Lupo» (already removed) and «Maestrale» (some of them already decommissioned, the remaining close to the attainment of operational limit) class frigates, both built by Fincantieri in the 1970s. The vessels «Carlo Bergamini» (F-590) and «Virginio Fasan» (F-591) have been delivered in 2013, the «Carlo Margottini» (F-592) in 2014, the «Carabiniere» (F-593) in 2015, the «Alpino» (F-594) in 2016, the «Luigi Rizzo» (F-595) in 2017, and the «Federico Martinengo» (F-596) in 2018. The Italian program has been fully implemented with the option exercised in April 2015, regarding the construction of the ninth and tenth vessel, whose delivery is scheduled after 2020. Orizzonte Sistemi Navali (51% Fincantieri, 49% Leonardo) acts as prime contractor for Italy in the initiative, while Armaris (Naval Group + Thales) is prime contractor for France. This cooperation has applied the positive experience gained in the previous Italo-French program «Orizzonte» that has led to the construction for the Italian Navy of the two frigates «Andrea Doria» and «Caio Duilio».